At Mazda Canada, we’re proud to offer some of the most exciting vehicles on the road today; vehicles that provide a uniquely exhilarating driving experience. We want to provide the opportunity to enjoy worry-free driving, even after the vehicle’s manufacturer’s warranty has expired. That’s why we’ve created the Mazda Added Protection plans to protect you against unexpected repair costs. Additional extended MAP coverage is also available for 2015 and later model year owners for 72/120,000 km, 72/160,000 km, 84/160,000 km and 84/200,000 km. If you lease your Mazda, your lease agreement and contract does not make allowances for unlimited kilometres. All Terms and Conditions of your financial lease agreement remain in place for kilometre allowances, payments, and penalties. The New Vehicle 36/80, 42/100 and 48/100 plans are ideal for individuals who lease a Mazda vehicle and want comprehensive coverage throughout the lease term. If you decide to purchase your Mazda at the expiration of the lease you can purchase additional comprehensive component coverage for up to 84 months/200,000 km at that time. 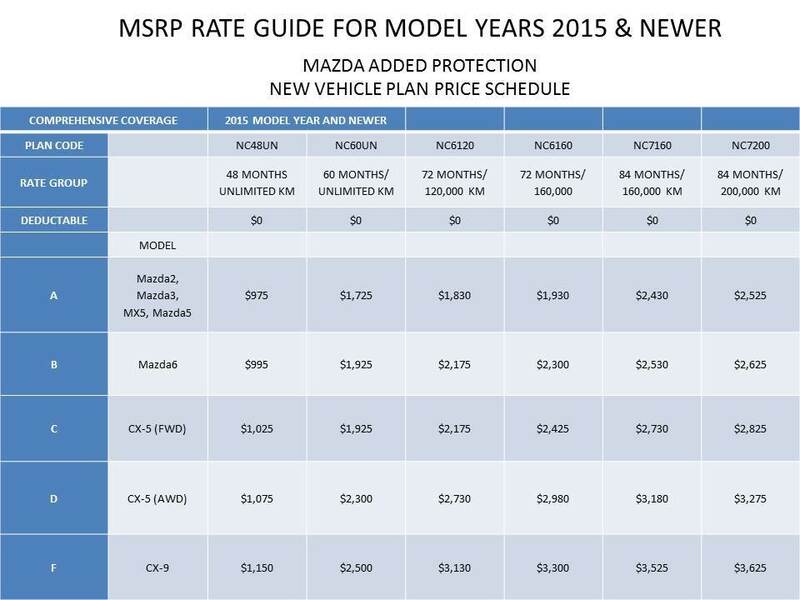 The New Vehicle 36/80, 42/100 and 48/100 plans are also ideal for individuals who purchase a new Mazda and would like the option to purchase additional comprehensive component coverage for up to 84 months/200,000 km at a later date. MAP Add Coverage plans can be purchased prior to the expiration of New Vehicle 36/80, 42/100, 48/100 and 48/unlimited mileage plans only. MAP is not available for vehicles used as taxi, courier/delivery services, police/security services, rental vehicles, snow removal or emergency services. For further details on limits or exclusions on the program please consult your Mazda Dealer. * Prices are subject to change, please contact dealer for details.